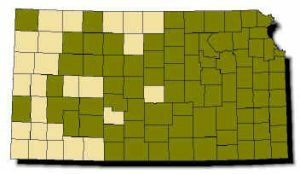 Range: Found throughout most of Kansas; least abundant on western High Plains where it is restricted to larger river valleys. Description: Harmless. Strongly keeled scales; belly with dark brown, orange, yellow, red and gray half-moons and speckles, widely spaced and scattered on the front part of a gray or whitish belly; dark brown complete bands on the front part of the body and alternating rows of brown or gray blotches on the back and sides of the rear portion of the body; old adults are uniform brown or gray. Young have a more contrasting pattern than adults. Habits: Found in almost any aquatic situation, from rocky streams and rivers to swamps, lakes and marshes. Active from March to November; becomes nocturnal in the summer. 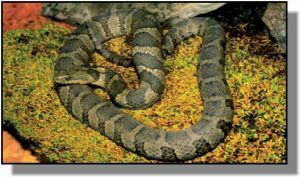 Spends much of its time basking in the sun on branches and logs which overhang water; discovered easily by looking under rocks along streams. Six to 66 young per litter, born in August or September. Eats small fishes, plus some frogs and toads.